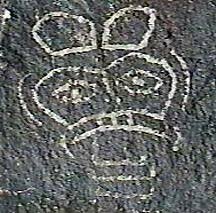 High above the Snake River Plain of southern Idaho, many hundreds of miles from the Pacific coast, lies this mystery shrouded in the mists of pre-history. This face, perhaps a death marker, lies hidden in a cleft of an obscure lava ledge at the foot of a high range of hills that separates the Camas Prairie of Idaho from the much larger Snake River plains to the south. The location is at the northern side of the only convenient pass through the hills. Today a state highway connects through this pass. In prehistoric times, it must have been a major travel route for native peoples. The mask is about 10 inches in height, pecked into extremely hard basaltic lava flow. The cleft in the ledge is just large enough that a grave could have been scooped out, a body placed in it, and earth and rocks piled over to protect the body from predators and to keep it safely through the ages. The cleft is filled about halfway up from the bottom, where it opens into a small gulch eroded by spring floods coming from the hills above. This view looks straight down into the cleft in the lava outcropping. The mask is facing to the west ... in the direction of the Pacific coast. Perhaps the traveller's companions wished that his spirit would have a face and eyes to forever gaze back upon his home. 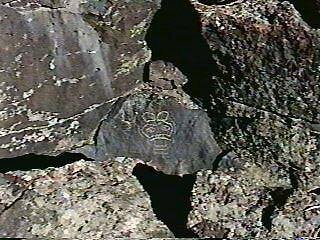 The petroglyph (rock picture) is done in a style attributed to the Columbia River native peoples, where designs of this type are found etched into the cliffs and outcroppings of the Columbia River Gorge. This style is not common to Idaho. It is easy to let one's imagination soar ... to gaze out across the wide expanse of the Camas Prairie, across the ranch fields and shallow wetlands toward the rural community of Fairfield. This area grew rich harvests of the native Camas root, a necessary staple of the native people's diet. Bands of people would come here every summer to harvest the roots for their winter larders. To the north, deer and sheep hunting was excellent in the many canyons leading into the mountains. It is probable that a travelling party would come here, to trade, to seek food, and to hunt. What tragedy befell this traveller? Was it sickness, or a hunting accident, or an encounter with a hostile, alien band? The answer is lost in pre-history, but the marker remains. The watchful eyes of the traveller's death mask scan the western sky, where eagles soar and the clouds stream rank upon rank in their ageless westerly flow from the traveller's homeland.